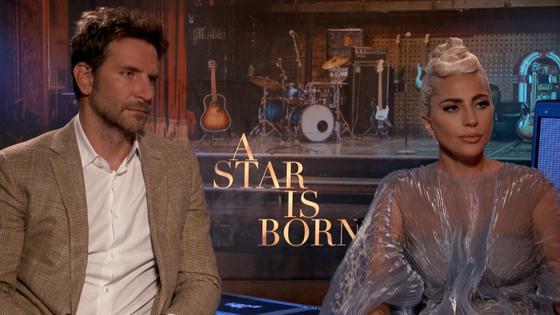 Lady Gaga & Bradley Cooper Talk Taking Risks in "A Star Is Born"
Congratulations are in order for Lady Gaga and Bradley Cooper! A Star Is Born, scored not one, not two but five Golden Globe nominations on Thursday. Cooper snagged a Best Director in a Motion Picture nod for his directorial debut, as well as Best Performance by an Actor in a Motion Picture, Drama nomination. Meanwhile, Gaga was named a contender in the Best Performance by an Actress in a Motion Picture, Drama category. Her song, "Shallow", also received a Best Original Song in a Motion Picture nod; although, many fans were surprised the movie did not receive a Best Original Score nod. In addition, the film received a nomination in the coveted Best Motion Picture, Drama category. For those who haven't seen the 2018 remake, A Star Is Born tells the story of a rock star named Jackson Maine (Cooper) who struggles with addiction. His life changes when he meets an aspiring singer named Ally (Gaga). After seeing her perform, Jackson decides to take her under his wing and the two form a romantic connection. But as Ally's star rises and Jackson's battle with addiction takes its toll, their love story becomes more complicated. The movie was a major milestone for both Cooper and Gaga. Not only did it mark the Silver Linings Playbook star's directorial debut, but it was also the first time Gaga had scored a leading role in a motion picture. Gaga and Cooper opened up to E! News about how they relied on one another while filming Bradley's directorial debut and Gaga's first big screen role. "The thing that I was very aware of from the beginning and I cherish even to this day is how much we both had at stake, because it was a first for both of us," the Hangover star explains. "We knew that going into it, we were really going to have to rely on each other, because it's scary putting yourself out there to this degree." While Bradley had experience in this area, with over two decades of acting under his belt, Lady Gaga had very little and took guidance from the director on how to become more vulnerable. "In a lot of ways I feel like Bradley unveiled me. It was his idea to strip away the makeup, to go back to my natural hair and for this to be Ally's character," she shares. The singer was able to do this because the "trust that I had in him every day on set just provided for a remarkable artistic experience." She adds, "I feel honestly completely humbled and grateful to be here sitting next to him." While this isn't technically The Fame performer's first onscreen role, it is her first time acting in a major motion picture. Her dream to be an actress started as a little girl and came to fruition when she starred as the Countess on American Horror Story: Hotel. She expanded on the transition, saying, "I studied at the Lee Strasberg Institute, which is derived from the Stanislaski method, and I acted on American Horror Story as the Countess, so I love acting but this was a very different experience and I just completely cherish it with everything in my being." Moreover, working on the film gave her the opportunity to observe and learn from the actor firsthand. "Just watching him direct, watching him write, watching him write, not just the screenplay, but watching him write music for himself, becoming a musician, seeing him create his character and him guiding me through the process. It was just incredible," she says. It's not too late to see the film. A Star Is Born is now playing in theaters. This story was originally published September 12, 2018 at 6:34 p.m. PT.